I wanted to put up my little tree today, but after two hours of almost continuous physical activity, I still haven’t even begun to unfurl the fake branches. Does anyone else completely rearrange the room their Christmas tree goes in or is it just a genetic defect in my family? My mom and my sister both do it. 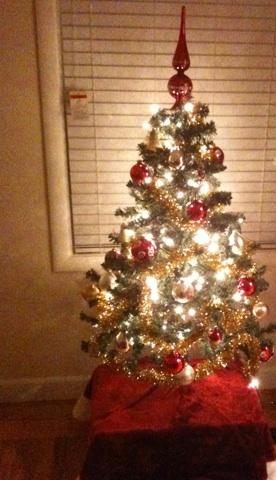 I know my grandmother and one of my aunts also move a few pieces around to put the tree exactly where they want it. I just moved around every single piece of furniture in my living room and even a portion of my “dining room”. I put dining room in quotes because my little tiny house doesn’t have a formal dining room. It has a large living room next to the kitchen with little direction as to where you are supposed to put a dining table. The placement of 3 doors and 4 windows in the room does not help. Granted, if I’d had some help and a better way to visualize things it might have been done more quickly. Then again, I’d have to listen to someone else’s opinion about my furniture arrangement and today I don’t feel like hearing it.